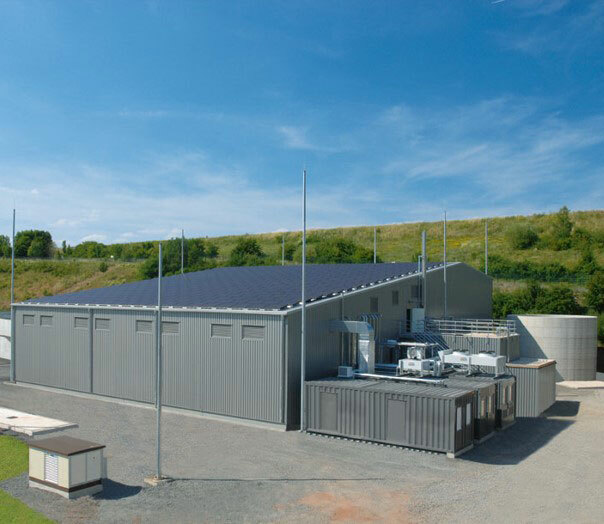 Execution of turnkey projects – design, delivery, installation, supervision, commissioning and maintenance of biogas (biomethane) plants and then the production of green energy in the form of biomethane, biofuel for vehicles, electricity, hot water, cold or steam from non-liquefiable dry biomass. Biomass suitable for processing (inputs): organic, pre-separated part of the municipal solid waste (MSW), fresh stems of plants – grass, cornstalk, etc. After the process of anaerobic (oxygen free) decomposition of biomass –the residual material – a dry mass containing nitrogen, phosphorus and potassium compounds (NPK), fiber and fine aggregates can be used for landscaping and re-cultivation. The construction of biogas plants is simplified – cubic concrete cells with airtight doors, without moving parts and sophisticated equipment. By using the best German expertise and technology, we guarantee up to 20% higher yield of biogas (biomethane), and respectively – larger amount of energy produced from each ton of inputs. The biogas is purified and injected in the grid or is burned in a combined heat and power generator (CHP).